I’ve only been gardening for about two years. My lack of gardening experience is complicated by living in a completely different climate than the one I grew up in (California vs. Missouri). I can’t believe how different gardens are here from what I observed in my mom’s garden for years. Annuals don’t actually die, tulips aren’t perennials, and the roses grow like crazy! I’ve also learned just a few things about fruits and vegetables in the last two seasons: You need a million strawberry plants to produce enough strawberries to eat (and it isn’t worth it to me, with my tiny garden and $1 strawberries at the grocery store). Grape vines take over like ivy, but they’ll produce plenty of fruit after two years (even for those of us who don’t make fancy trellises). 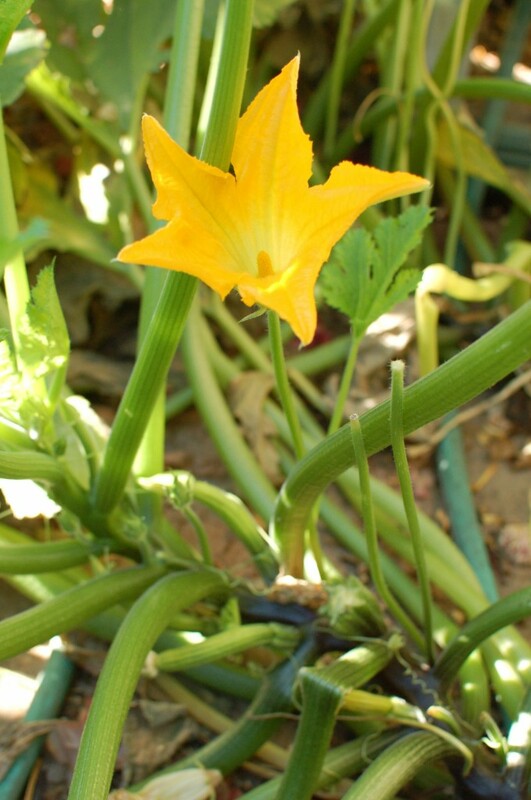 And zucchini, the wonder vegetable, sometimes needs a little help. Everyone told me that I’d have SO much zucchini, that I anxiously watched my two little seeds grow into huge plants and excitedly awaited my first loaf of zucchini bread. After several weeks of flowering, I noticed that all my baby zucchinis were shriveling up at 3 inches long. What the heck? The good ole interwebs knew what was wrong. My zucchini wasn’t getting pollinated! 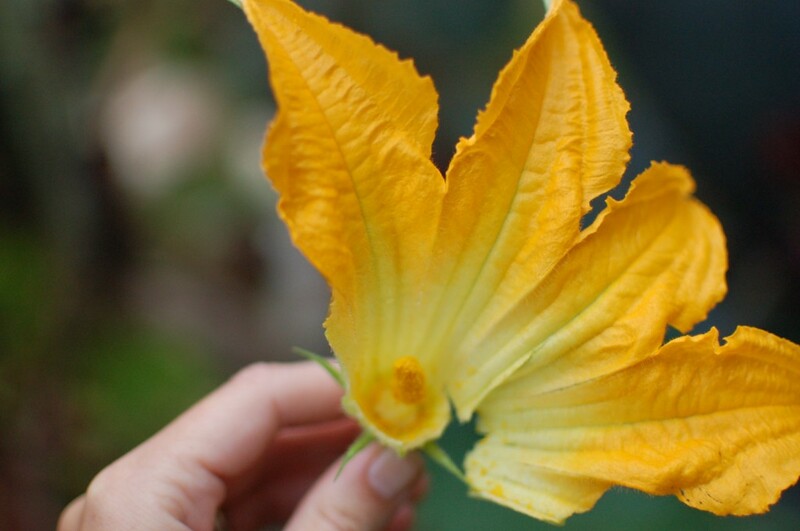 The good news, especially when you have plants that have taken over a 6 x 6′ portion of your garden but aren’t producing, is that you can pollinate them yourself. 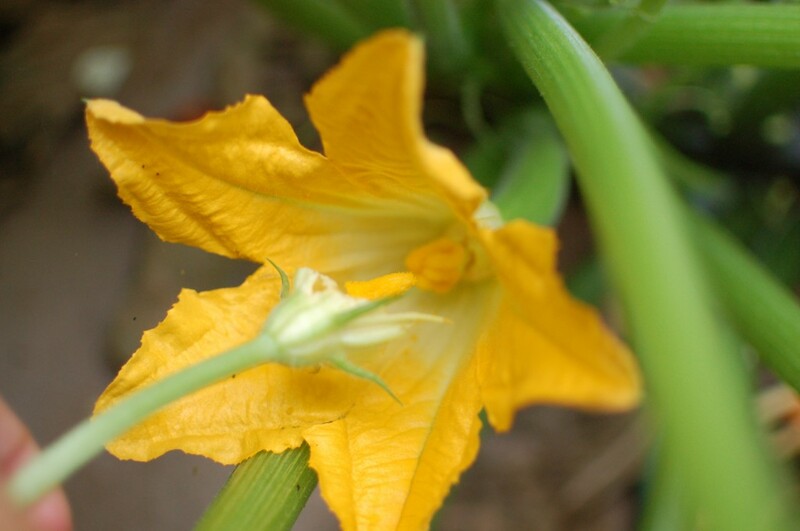 Pollinate the zucchini in the morning, when all the flowers will be open. First identify the male and female flowers. 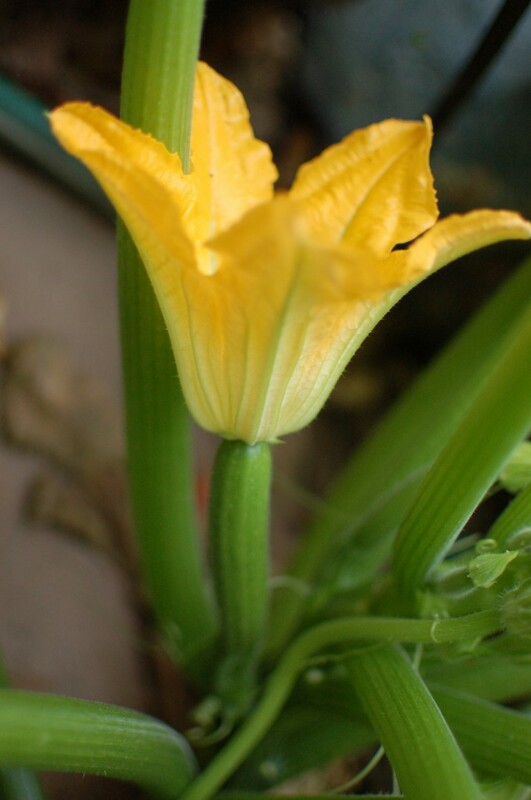 The male flowers (left) are attached to a long, thin stem, but the female flowers (right) are attached to the tiny zucchinis. When you have both male and female flowers open, pick a male flower and pull off the petals. 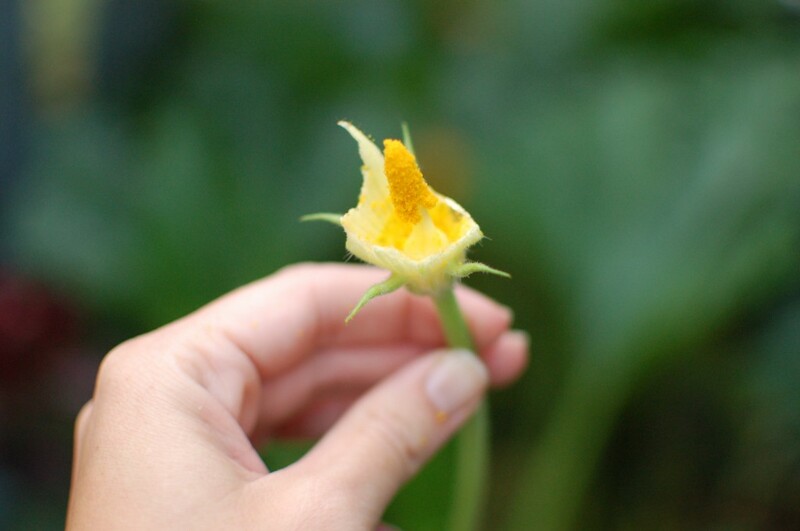 Rub the fuzzy yellow inside of the male flower, the stamen, on the inside of the female flowers, the pistil. That’s it! You can also use a paint brush to transfer the pollen. 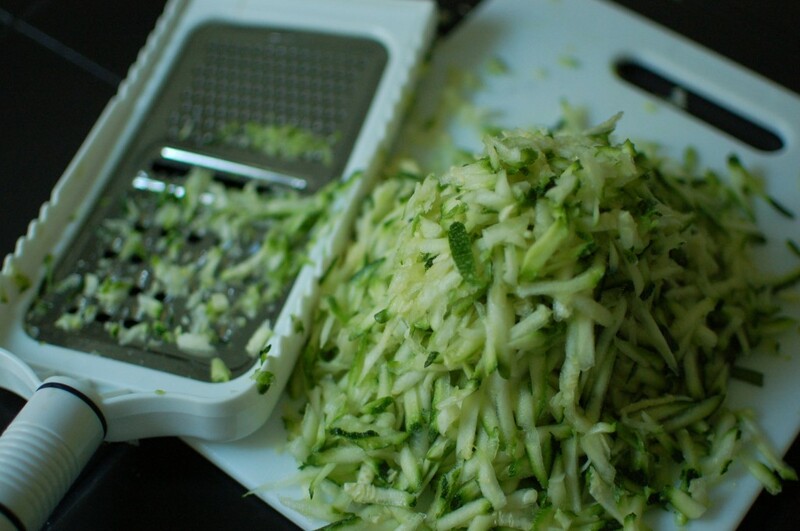 Suddenly you’ll be grating mounds of zucchini, just like everyone else has been doing all summer. I’ve tried a couple different bread recipes since then. First, the Best Recipe Cookbook version. 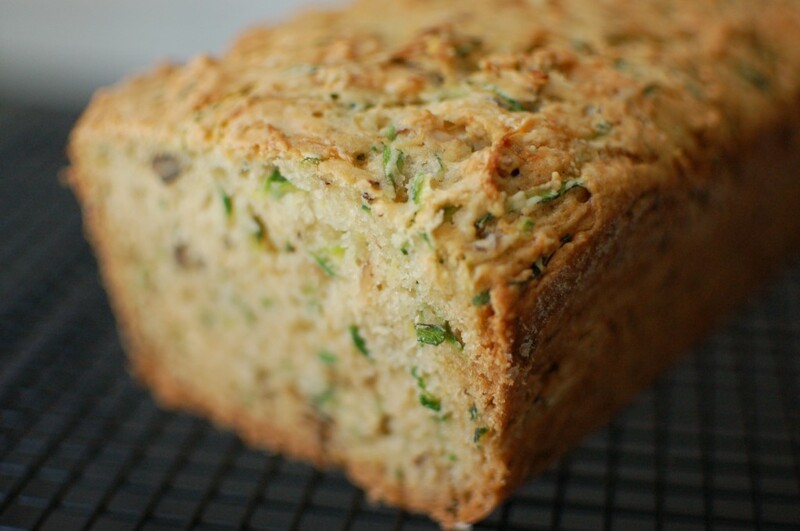 They strove for a lighter bread with more of a zucchini flavor, and they accomplished it (shown above). Next, I tried a popular allrecipes.com version. It’s the classic dense, sweet, is-there-really-a-vegetable-in-here? recipe, and it was the one I preferred. 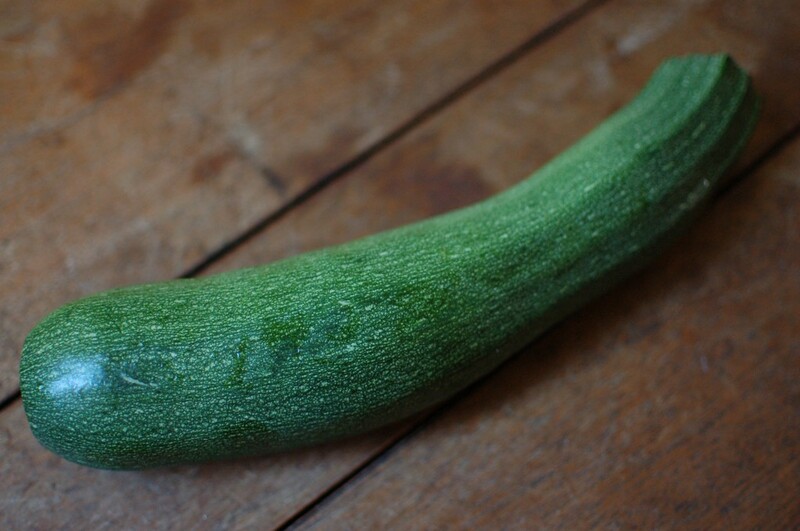 A few other things I learned about zucchinis: 6-8″ may be the ideal length for harvesting (before they become bitter), but the giant ones are just fine for baking. My 18″ zucchini grated into enough for six loaves of bread! Not that I’ve baked them all yet, though, because I also learned that grated zucchini freezes well. Slice large zucchinis in half and scoop out seeds first, then grate and divide into two cup portions per ziplock. No need to drain! To save freezer space, let them freeze flat on a cookie sheet. It’s a great recipe, and the zuccini are now growing big enough that I got to have one!